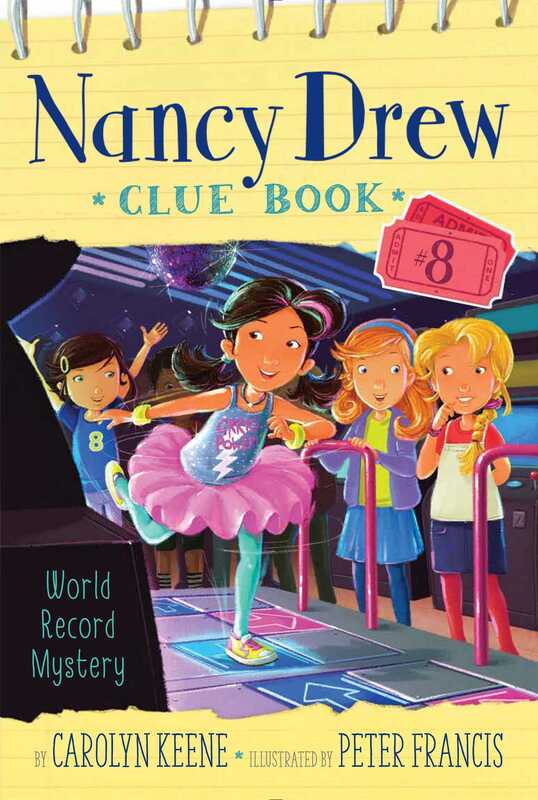 Help Nancy and her friends find a missing lucky headband so River Heights teen Katie can break the world record at the local arcade’s dance game in the eighth book in the interactive Nancy Drew Clue Book mystery series. But just as Katie’s about to get ready, she notices her lucky headband has gone missing! She always wears the blue, sparkly headband when she competes and knows she’ll bomb without it. Luckily, Nancy takes her Clue Book everywhere. Nancy, Bess, and George are on the case! Who is sabotaging Katie’s big day? Could it be the owner of the rival arcade, Michael Parker, who wanted the judges to see his world record sock attempt? Or May Bensen, the current Dance-A-Thon record holder? It’s up to the Clue Crew—and you—to find out! Nancy Drew and her best friends, Bess Marvin and George Fayne, joined the rest of the crowd at Starcade cheering for River Heights teen Katie McCabe as she spun across the electronic floor pad of the Dance-A-Thon video game. The local arcade was full of fans watching the gaming whiz practice her moves. Katie’s feet flew over the lit-up squares, and she added arm movements to match the rhythm. In just a few hours, a judge from the Beamish Book of World Records would be there to record Katie’s attempt to break the current high score! “This is so exciting!” exclaimed Nancy. “I hope by the time I’m sixteen I can dance like Katie,” Bess said. She tried out a kick step and almost crashed into George. Nancy and her friends were eight, and even though they didn’t have dance moves like Katie, they were already experts at one thing: solving mysteries. Nancy, Bess, and George called themselves the Clue Crew. George was the tomboy of their group. She and her cousin Bess were as different as night and day, but that didn’t stop them from being as close as could be. The three girls took turns bowling at the Skee-Ball game. Bess got three balls into the tiny opening worth one hundred points and collected six tickets when the game ended. “You’ll need to win a lot more games to have enough tickets for a prize that big, Bess,” Nancy said, handing her friend the three she’d scored. The girls turned around to find Christopher Finn, the owner of Gamespot, just behind them. His arcade was down the street and was another popular hangout spot for the kids in River Heights. Mr. Finn hung his head and shuffled past the girls. Bess, Nancy, and George shared a sympathetic look, but it took only a few moments for them to get back in the mood to play. The arcade was full of energy and sounds: bells, dings, chimes, laughter, and happy squeals! When they were done racing, Bess and George played against each other in air hockey. For two girls so different, their skills were well matched and the game ended in a tie score. “Hmm, I know we said I’d play the winner, but how will we pick now?” Nancy asked, rubbing her chin. The girls spun around to see Michael Malone holding up a game token in his hand. Michael was in fourth grade and a close buddy of Ned Nickerson, one of Nancy’s friends. Michael held the token up to the sky and blew on it, before dropping it into the air hockey machine and pressing start. He flipped the red puck in his hands before setting it onto the center of the table.